From MEDICOM Toy. A PREVIEWS Exclusive! 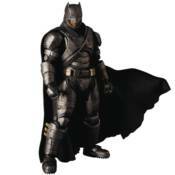 Based on the upcoming action-adventure film Batman v. Superman: Dawn of Justice, this figure of Batman in his armored suit stands approximately 6 1/4' tall and boasts superior detail, generous articulation, a poseable fabric cape, interchangeable hands and a poseable display stand.